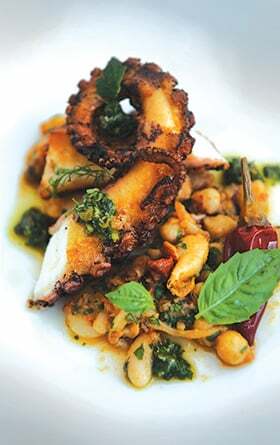 Beckoning Dishes: Hearth-roasted octopus with cured tomato and “Italian” bean salad. Dress Code: Smart business suit; your best shoes. Three men in bespoke business suits fell silent as their plates arrived, abruptly halting their numbers-driven, handout-focused lunch meeting. Surveying their beautifully outfitted plates of fish, garnished with vegetables that functioned much like Jennifer Lawrence’s peplum at the Academy Awards, they tentatively took bites, then fell into the food. “I don’t know what that is, but it must be endangered,” one finally said. “It’s never good unless it’s endangered.” They all nodded sagely and returned to their triggerfish, which, despite its delicate deliciousness, is among the most sustainable seafood available. Ford Fry strikes again, with his winning formula of fashion-forward food and mindful conscience, blended with a thorough understanding of what people want to eat. St. Cecilia is the action-hero-named chef’s fifth restaurant, following up on JCT. Kitchen, No. 246, The Optimist and the red-hot King + Duke, recently named by GQ as one of the best new restaurants in the country. St. Cecilia’s namesake is the patron saint of music, but Fry has said his meaning here refers more to a tempting siren, luring unsuspecting diners to deep-sea delights they’ve never before experienced. The space – long anchored by Bluepointe, the Buckhead Life Group’s most high-profile restaurant – has been made both more contemporary and more comfortable, while maintaining a sense of high style. Fry has opened the draperies that separated diners from this most happening stretch of Atlanta, on Peachtree across from Phipps Plaza. At lunch, light streams in over the washed woods and polished white tiles; at dinner, a sexier, subtler vibe accompanies the stream of taillights, headlights and nightlife outside. The interior feels less like a stretch limo with tinted windows and more like a classic beach convertible. Ford calls the food “coastal European,” and you’ll find the same ethereal handmade pastas and Mediterranean accents that make No. 246 better with each successive visit. Here, however, the accessible but more sophisticated preparations address the Buckhead clientele, and by 8 p.m., a nattily dressed crowd is lined up four deep at the big, curved bar. The siren’s overture begins with a round of warm focaccia, with olive oil and whipped ricotta. Lunch and dinner menus vary slightly, with an offering of open-faced “tartines” and a larger selection of salads and soups at noontime and an ex-panded selection of “secondi” (larger, entree-type plates) at dinner. At lunch, the single-punch knockout was the charred octopus, which has the singular exterior crunch of excellent fried chicken, with the luscious interior texture of sweetbreads. (My companion had just returned from Greece, and she said it was better than any she sampled there.) A simple Bibb salad with poached shrimp, fennel and blood orange segments tossed in pink peppercorn vinaigrette is the kind of midday meal you’d have every day if you could. The ravioli with apple, mascarpone and pecorino, garnished with green beans and Brussels sprout leaves, is well balanced with only a hint of sweetness. Our only disappointment: The Nutella torta, a thick cookie-like dessert with gelato, its texture and flavor more suitable for a kid’s birthday party, the Nutella “powder” downright off-putting. The “panini di gelato” (ice cream sandwich) was better, but it, too, lacked the wit and light hand of the rest of the menu. As at Fry’s other restaurants, you’ll find storybook cocktails, from the Green River (gin, Cynar, muddled arugula) to the Let It Bleed (Elijah Craig bourbon, Cherry Heering, tangerine juice). There are also intriguing non-alcoholic concoctions, like the house-made lime soda. At dinner, you’ll also find a list of crudo, including oysters, langoustine and iced crab. The sliced, raw hamachi (yellowtail), with pistachio, sunchoke puree and ruby pomegranate, is an excellent beginning. Spaghetti with Jonah crab, serrano chili and crisp, garlicky breadcrumbs is as good as it sounds; shiitake risotto (with whole roasted garlic cloves) a balm and comfort. Dark brown roasted Brussels sprouts looked flash-fried and oven roasted, with leaves as crisp as an antique first edition. The evening’s entree selection in-cluded Maine sea scallops, swordfish, whole loup de mer, as well as a veal chop and New York strip, but we chose the triggerfish. Garnished with roasted calamari and heirloom potato, the filet was lightly pan-roasted with a cornmeal dusting. Those businessmen were right – it tasted too good to be so virtuous. But as Ford Fry moves into a space empire-builder Pano Karatassos once ruled by pleasing both critics and crowds, he shows it’s possible to be both smart and beautiful.